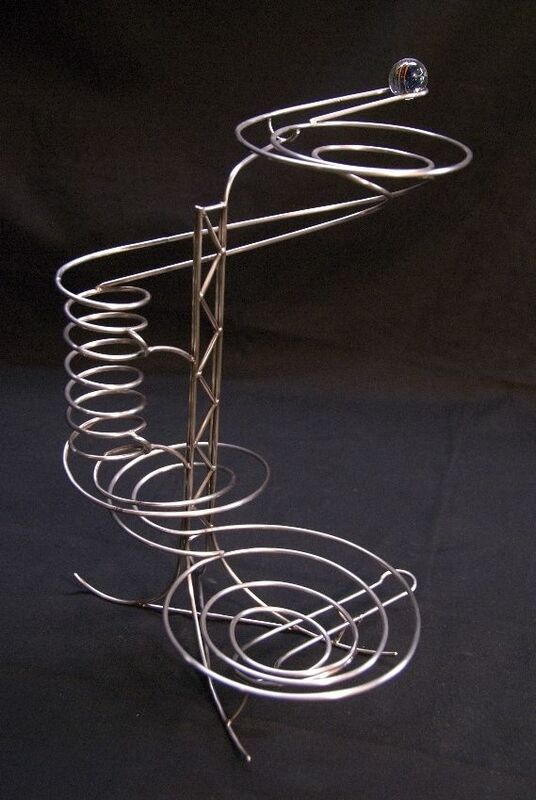 Emerging, a kinetic sculpture, measures 13 3/4" x 10" x 9 3/4" and is made entirely of TIG-welded stainless steel. This piece is sized suitably for an office desktop or side table. Not only does Emerging display unique and eye-catching frame work, it also features both large and small spirals as well as an energetic and quick vertical coil. The sculpture even comes with its own unique marble not featured in larger works. All components of this sculpture were formed by hand from straight lengths of stainless steel wire using common hand tools, pipe sections being used on occasion to produce a desired bend or curve.